V.com weekend vote: Do you stretch before and/or after playing the violin or viola? I've said it before and I'll say it again: Playing the violin can be a pain in the neck. Literally! One of the easiest ways we can prevent injury is to stretch before playing. In fact, here are three articles that are full of good stretches to do, to keep yourself pain-free while engaging in this strange physical activity of violin-playing. But how often do you do your warm-ups before rehearsal, practice or performance? Back when I played in the Omaha Symphony, I managed to injure my neck enough to seek out a physical therapist. She gave me a set of neck exercises to do before playing, and for several months I dutifully stretched for five minutes before rehearsal and practice. Then the pain went away, and I stopped! But the best treatment for these problems is prevention, and that means doing the neck, wrist, arms stretches even when there is no problem. In fact, as I think about this as a teacher, stretches might be a good way to start off lessons with students, introducing those good habits from the beginning. I'm curious about whether very many people routinely stretch before and/or after playing. And please feel free to comment on any exercises or routines that you find helpful for preventing injury and/or recovering from injury. I missed the "I know I should" category! 1. Get the blood pumping before stretching. I work out 4 days a week -- resistance training with weights. The sequence I learned at the beginning: Walk, Stretch, Lift. For violin, it's Walk, Stretch, Practice. 2. Stretch DURING sessions as well as before and after. 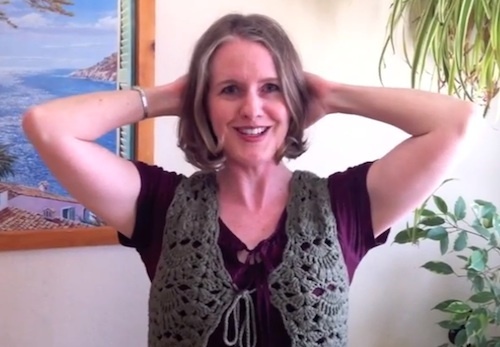 I pause fairly often throughout the hour to stretch the neck muscles and stretch both arms straight out to the side, then up toward the ceiling, then down toward the floor. It might be only 15 seconds at a time, but I find that it really helps my endurance. Important and helpfull advice! Thanks a lot. Warming-up exercises (including stretching) have always been an integral part of my violin lessons, and it is something I regularly do before every practice or playing - advisable at my age, I might add. I remember a workshop in Bristol given by the Orchestra of The Age of Enlightenment who were on tour. They spent a good quarter of an hour talking about the importance and benefits of a warm-up and took/put(?) us through it before we started the workshop proper (a Haydn symphony, as I remember). Need another voting option - ALMOST NEVER. "yes, most of the time" and "yes, but not an official stretching session"
They do stretch afterwards, however! That is something I neglect and I really shouldn't... most often when rehearsal or a concert ends, I'm running to get somewhere else rather than taking care of myself. I need to get back to it, but I used to do exercises from Gregory G. Irwin's Finger Fitness, the Art of Finger Control throughout the day, but always a few before I practiced. I also have the Cowling System, but have only worked with it a few times. Practice has been catch as catch can lately, but now that the kids are back in school I should get my schedule back in order. Including the finger exercises and yoga. Once in a great while if I am stiff or sore from something else like sitting at my desk for too long, otherwise I dont practice for hours and hours so I dont get these violin related aches and psins. I stretch most days and have good underlying flexibility so I don't feel a need to stretch before playing, but I always stretch after playing. I don't even think about it, my body tells me to do it. It's not an elaborate ritual just a few neck rolls, shoulder stretch and touching my toes to stretch the back. It just unlocks everything and puts it back to where it was before.